Bell Valley is a purposeful place to renew, re-energize, and reconnect to yourself, the land, and your passion for meaningful work. We provide retreat space for groups working on social change and personal growth, as well as businesses deepening their strategies and team dynamics. 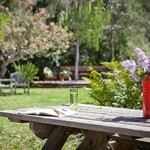 Bell Valley Retreat was designed with careful intention for your experience. Six miles of trails weave through the beauty and solitude of rolling oak hills and open meadows. Unique accommodations are thoughtfully integrated into the landscape. Restorative meeting spaces offer a welcome change from the usual constraints of work environments. Various outdoor spaces were sculpted for gathering and contemplation beneath the old growth trees. where nature heals and gives strength to body and soul alike.